My earliest memories of what it meant to be a doctor, like most of us, involved our family physician. He was a kind soul who had an amazing capacity to look beyond a patient dealing with asthma, and treat the little kid who just wanted to play and have fun. As I went on to become a physician myself — and then a doctor in a busy, demanding practice — I always had beacons of light, leaders in my field, who were my compasses. 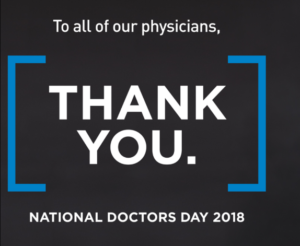 National Doctors’ Day always makes me stop and reflect on those people I admire most — the physicians I have been honored to know, and now the role models I work with every day. As President and CEO of Rochester Regional Health, I am exposed every day to the complexities that have emerged in medical care throughout the United States. More importantly, however, I am exposed to stories of heroism, sacrifice and compassion that leave me in awe. Sometimes it’s a simple gesture, like a doctor calling a patient who has recently lost a spouse—just to check in. Sometimes it’s more involved, like physicians as a group deciding to serve refugees and the homeless—making room in their practice for people who can’t ask for help in their own language but, nonetheless, need it. Sometimes it’s witnessing a physician work tirelessly for their patients when they themselves are exhausted and discouraged. It’s also something I can see in the face of young physicians in training, when they finally get ‘why’ they are doing ‘what’ they are doing. Doctors’ Day also makes me wonder what’s next? At Rochester Regional Health, we continue to enable physicians to follow their sacred calling. We would like to exceed expectations for our patients, and foster compassion and excellence in the generations of doctors to come. We want to ensure that the brand of medicine we provide promotes health that is not crisis driven, but sustainable. Most importantly, I am humbled and deeply grateful as I look toward our future. Thank you to the doctors of our region. Thank you for every next moment – for every second chance you bring to your patients and their families. Your relentless drive, and your commitment to care with dignity, and compassion is inspiring to us all. Posted March 30, 2018 under _Featured Stories List, CEO, Leaders / Managers, Locations, News, Physicians, Weekly Beat.